These two women monks have lived for decades dedicated to the path of service, observing strict rules with joy. If the final state of samadhi has not been reached, full living liberation, in his presence, will it ever? There must be some doubt that creeps in after so many decades of practice. Once your source of inspiration is no longer there to hold your hand, does the devotion weaken? Do you begin to question some of the choices that are made for you? How to dress–does that really lead to enlightenment? How to eat, how to talk, how to sit, how to love, how to live? When the lessons have been learned, the meaning of each practice mastered, are those practices still necessary? Or are they never mastered? And is mastery really that important? I accept learning discipline in order to truly find oneself on the deeper level, the level of understanding the separation of ego and the true Self. Learning to let go of all the distractions is important. When we have mastery over our desires, needs, bodies, and minds nothing can influence or obstruct the way within. When the body is healthy we are free from it, we are free to focus inward. When we have cleaned the mirror of the mind, only our pure Self is reflected back at us. When our hearts are pure, only God’s love radiates forth. But we can never remove ourselves from being human, imperfectly human. Imperfect. Does true mastery mean mastery over human nature and the natural weaknesses that entails? If overcoming our humanness is impossible, should that be an obstacle to enlightenment? Is samadhi only possible with perfection? If you have dedicated this life to following the path, with patience and diligence, laid out for you by a trusted guru, and enlightenment (or the ultimate samadhi) is not attained, then what happens in the next life? What if your next incarnation has no propensity toward a spiritual life? Was it all a waste? Was it all a joy? Is how we live our lives really that important in the end? Is there an end? At the Institute, I was given the task of keeping the ceremonial flames burning, little vessels on every altar throughout the Institute that should always be alight. This job entailed pinching off the burnt, blackened end of the cotton wicks, filling the little vessels with ghee, and relighting them. I also helped clean the guest rooms and bathrooms for the newly arriving participants. I enjoyed feeling useful. In joy. 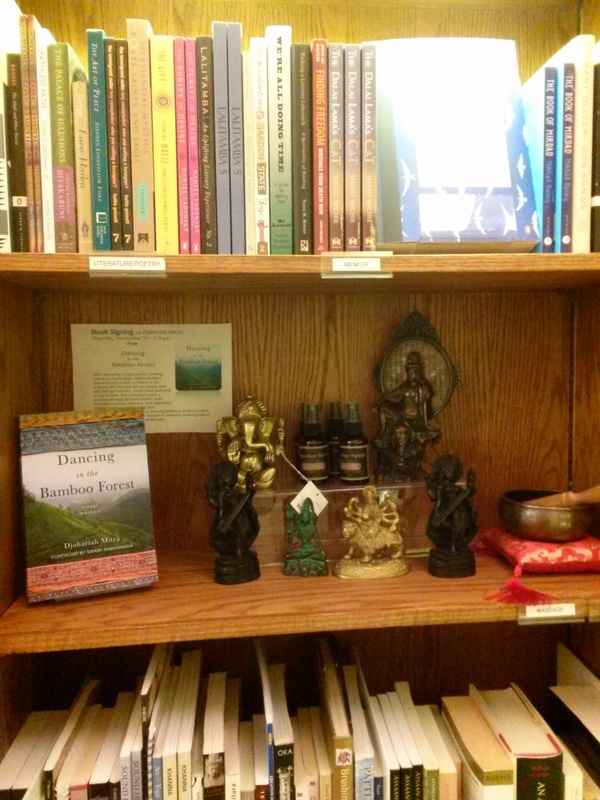 I decided to visit the doctor who was giving us lectures on Ayurveda, an ancient Indian medical system. He sat me in his small, sparse office on a hard chair next to his desk, held my wrist, felt my pulse, and asked me many personal questions. He looked in my eyes and at my tongue. He covered every area of my health, and I discussed my particular issues. He instructed me to eat raw fruits and vegetables once a day and to reduce eating meat, as it was making my body work too hard and took away from my body’s own ability to heal itself. He then gave instructions to his mother for the herbal mixture to be added to the massage oil and the particular way she should massage me. She led me into a square concrete room with a large wooden table at the center and instructed me to undress while she warmed the oil. I stood naked holding my clothes in a bundle in my arms. She gestured for me to put them on a chair and lay on the table. She generously slathered me with the warm herbal oil. The excess oil drained off into deep grooves around the edge of the table but left an exceedingly slippery surface. As she worked, she moved me around and helped me flip over making sure I didn’t slide off the table. Her touch was vigorous, strong, and somewhat painful as she meticulously followed the energetic paths of my body, penetrating all points of blockage, tension, or dysfunction with her strong fingers. These areas were tender and deep. I felt bruised. She worked through every system of the body through the pattern of her movements: lymphatic, digestive, circulatory. Then she led me to a little bathroom and scrubbed the oil off my body with coarse salt until I was raw. She left me with a bar of soap and a bucket of hot water to clean off. I felt warm and smooth. She brought me a towel and I was led back to my clothes to dress. She smiled caringly as I walked out the door and back into the dusty heat of the street. I watched as it moved from place to place, from movement to movement. I watched myself pack a suitcase and print my boarding pass. goodbyes. I disconnected from relationships. somewhere else on the planet. airport spa. I took them up on all of it. I stepped out of the cool airport into a great hot, sticky, sweaty climate. across old, cracked stone steps that led up into a shroud of trees. I followed. smell and taste plants and animals growing from a unique soil and sea. I felt so free in a new land far from everyone I knew, far from my life, far from who and what reinforced a perception of me that didn’t feel true. The blur was replaced with clarity, the dream suddenly faded into sharp reality. The thread of my life had not been broken; it continued in its interweaving trajectory creating the web of my existence, a creation seemingly tangled but that I know in its entirety is beautiful. Excerpt from my book launching this Thursday November 13th at the Integral Yoga Institute New York at 7pm. 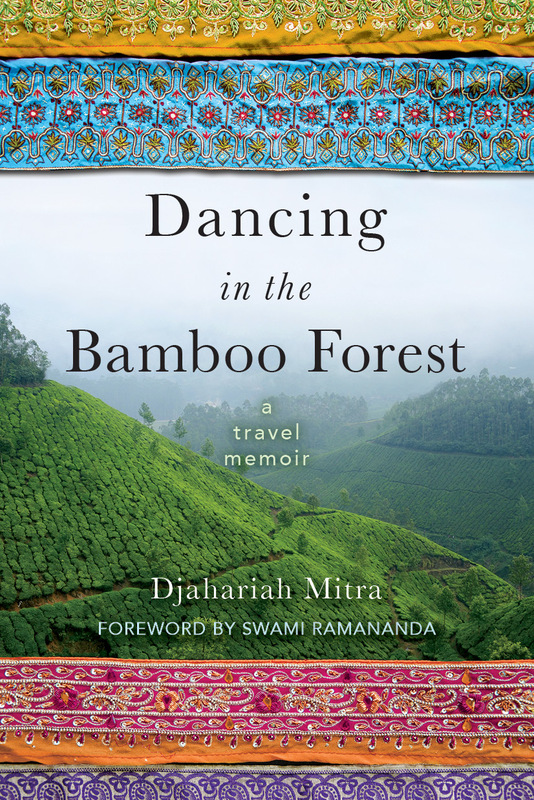 Buy your copy of Dancing in the Bamboo Forest here! The intensity with which Indians look instantly into your eyes is amazing. On the bus it was especially amazing – moving by so quickly in opposite directions someone will catch your eye – not for a second – but for an impossibly long time. It seemed as if you could see deep into each other in the smallest moment. 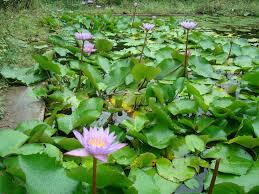 My breath deepened as I watched the film of life fly by past the open doorway of the bus: a sea of lotus blossoms, fields of rice, beaches in the distance. Every few moments the horn of the bus squawked as we careened around motorcycles, tractors, and oxen plodding along steadily, pulling their load as their driver tapped them with a stick while he laughed into his cell phone. The door was just a hole in the side of the bus, I was afraid my suitcase was going to fly out at any moment. The bus stopped for a break. The flies invaded through the glassless windows while we waited. Bulls meandered past, followed by a herd of goats. I saw the resemblance between goat and human kids – energetic, running here and there, jumping out of line and being herded back into place, getting excited and then complaining about the lack of freedom. On the road again. The driver was flying; we made good time. The road from Mahabalapuram took me past Auroville and I reminisced about their delicious kulfi. 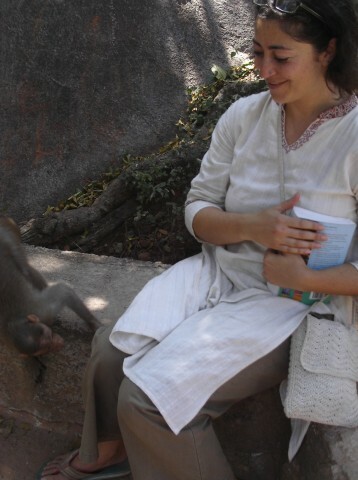 In Mahabalapuram, on a shady wall my friend and I sat to catch our breath and cool down, when a young monkey scampered over to us. He had spied my water bottle and became determined to capture it. He wasted no time knocking it out of my hand and we watched curiously as he tried to drag it away. It was nearly full and I’m sure weighed more than his slight body. He pushed and pulled, it rolled down a little hill, he dashed after it. Finally he hunkered down to try opening the bottle to get at the good stuff inside. I almost wanted to go over and help him. A few adult monkeys felt the same way and he had to push and pull and drag his prize away a few more times. When he managed to crack an opening into the bottle and drink what didn’t spill, I was happy for his success. Then he came back and thought he’d have a go at my guidebook. We decided it was a good time to leave. It has been a few years since I traveled and lived in India but the memories are still vivid and immediate. The intensity of the experience has been seared into me. Travel has a way of becoming who you are as all of those memories and experiences transform the eyes through which you see.